Shanghai, China’s economic center and located in eastern China is frequently linked by flights and trains with Guangzhou, the trade center in southern China. 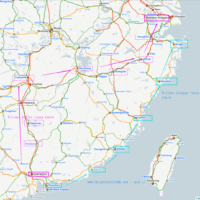 There are frequent flights flying between Shanghai Hongqiao Airport or Shanghai Pudong Airport and Guangzhou Baiyun Airport, which takes just 2.5-3 hours or so. While there are also frequent trains running between them, which take about 7.5 – 22.5 hours depending on which type of trains you take: the G-class high speed train, slow train or high speed sleeper train (D trains). 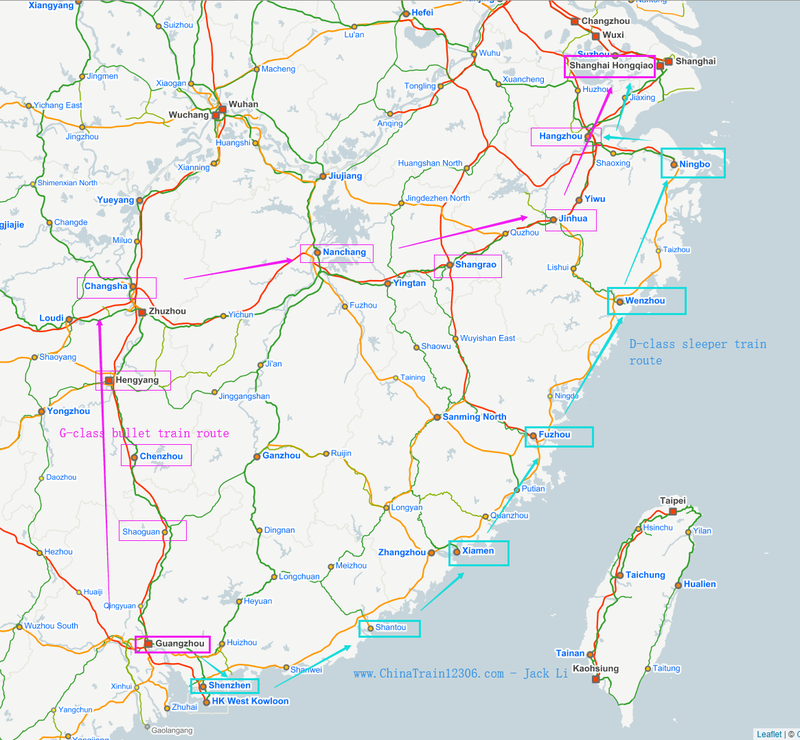 If you have any questions on your Guangzhou – Shanghai train travel, just ask Jack. I’d love to offer my help. Contact Jack. 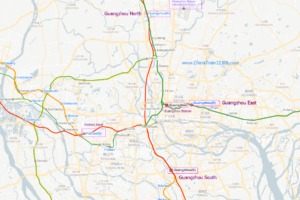 As of April of 2019, there are 4 daily G-category high speed trains running between Shanghai Hongqiao Station and Guangzhou South Station from 08:00 to 15:38,taking around 6h50 to 8h27 and costing from CNY793 in a 2nd class seat, CNY1302.5 for a first class seat and CNY2492.5 for a business class seat. G-category high speed train is the fastest and most advanced bullet trains in China with a top running speed of 350km/h. 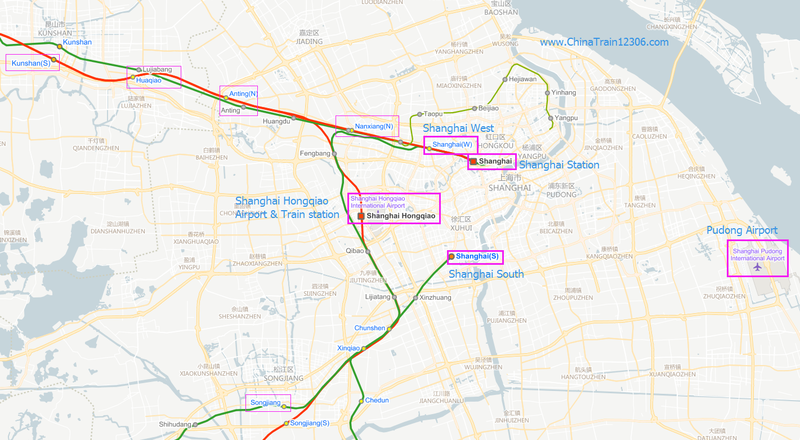 Major stations along Shanghai-Guangzhou G train route: Shanghai Hongqiao – Hangzhou East – Yiwu – Jinhua – Shangrao – Nanchang West – Changsha South – Shaoguan – Guangzhou South. For more stations, just see the railmap above. In addition to G-class high speed train, there are also D-class high speed sleeper trains running between Shanghai Hongqiao Station and Guangzhou South Station. They are only available on Friday, Saturday, Sunday and Monday weekly. These D class sleeper trains departing around 19:30 or 20:00 at night and arriving at 11:00 or 11:30 the following day, saving you a night of accommodation. The ticket price is also fairly cheap. An ordinary sleeper of D class train costs from CNY700 or CNY760. A deluxe sleeper costs CNY1270. 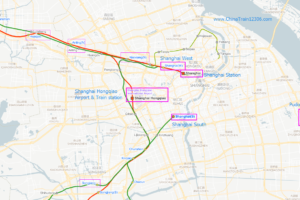 Major stations along the D train route: Shanghai Hongqiao – Hangzhou East – Ningb – Shenzhen North – Humen – Guangzhou South. Total travel fares: CNY700 or CNY760 for a sleeper. 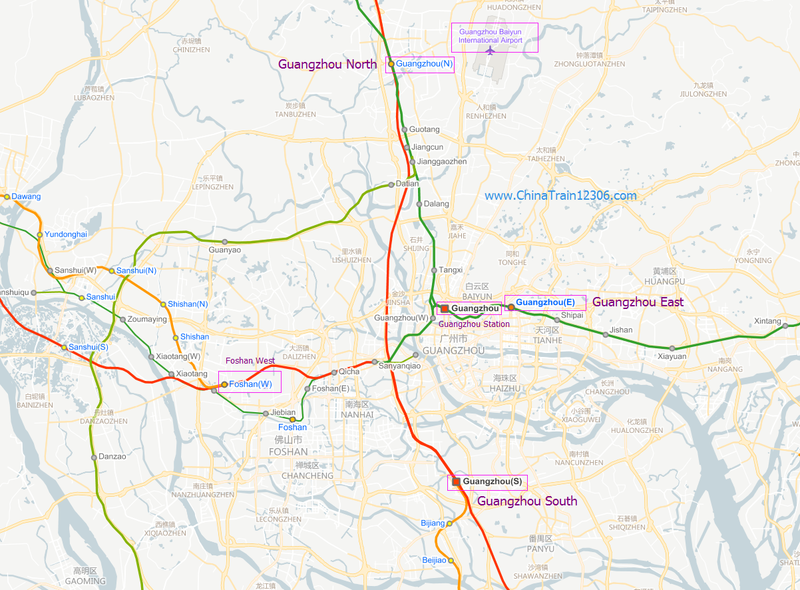 Both Shanghai – Guangzhou G-class high speed trains and D-class sleeper trains are using the Shanghai Hongqiao Station and Guangzhou South Station (Guangzhunan). You can buy tickets yourself at any stations in Guangzhou or Shanghai with your passports about 30 days in advance. If you buy tickets in train station in Shanghai, you can go to Shanghai Railway Station, which is centrally-located with easy access. While if you are in Guangzhou, just go to the centrally-located Guangzhou Railway Station or Guangzhou East Station (Guangzhoudong). But if you don’t speak Chinese, you may use a trusted online ticket agent. Service time: 24/7 hoursPayments: Paypayl, Visa, MasterCard, Alipay, etc. This entry was posted in travel and tagged guangzhou, shanghai by jack-chinatrain12306.com. Bookmark the permalink.